Works Progress exhibited 12 artists working with little money, but great talent. Each piece had a $500 price limit and included everything from paintings to installation sculpture to interactive art. 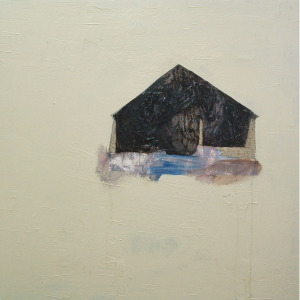 Megan Berk left California about a decade ago and received an MFA from Pratt Institute last year. She now works out of Red Hook, Brooklyn and says she has never been happier or more broke. With her art, she investigates places that evoke her middle class desires and a recognition of the feebleness of those desires. 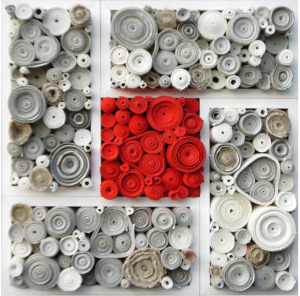 Amanda Boulton combines discarded or disposable objects giving them a new life or history. Most recently she has been exploring the symbols and rituals different cultures have when it comes to luck or money. Zach Chupa considers himself to be an artist, athlete, dog lover, and critical thinker. 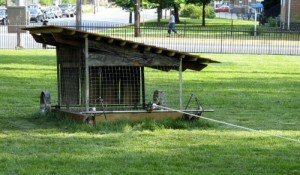 His installation pieces combine sculpture, photography, writing, drawing, and performances. He currently lives and works in Philadelphia. 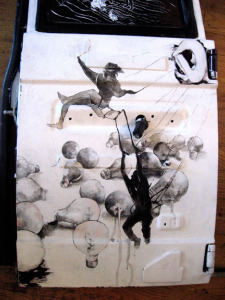 Julie Floersch is a Brooklyn based fiber artist who moved to New York eight years ago from the rolling plains of Iowa. 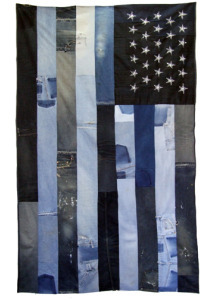 She quilts with discarded materials, primarily denim for its haphazard and painterly qualities, juxtaposing handcrafted traditional Americana and pop culture imagery. Emily François created a series of dollar store collectible plates dealing with suburban landscapes and the contradictory desire for cheap, ready-made goods and immortality. 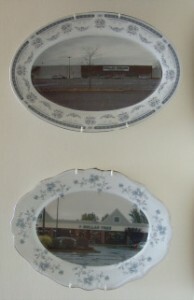 Each dollar store is presented on a souvenir plate; a remembrance of someone’s visit to the land of consumerism. Katerie Gladdys transforms mapped landscapes and familiar interactions into alternative geographies. 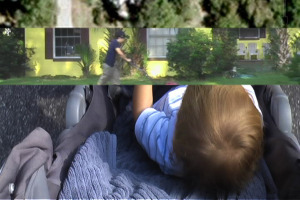 Slash and burn land clearing in Florida provided an optimal habitat for edible weeds and she created a micro-video documenting the tragedy, irony, and possible redemption of these landscapes left fallow by the recession. Angela Jann grew up in Detroit. 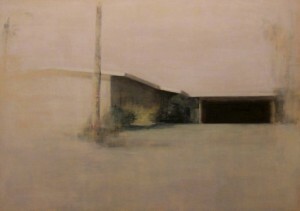 Her work focuses on the Rustbelt’s decay during a time where industry and factory jobs have become obsolete. She painted homes being sold in Detroit for under $500 and will be selling these exact homes in the gallery along with the art. Jonathon Kambouris is a still life photographer who gravitates to gritty, dark, and taboo subject matter. 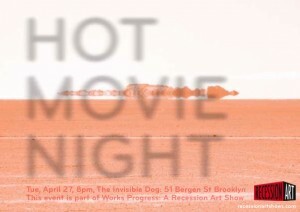 In 2009, he was named one of the world’s best emerging photographers by 3rd Ward in Brooklyn. 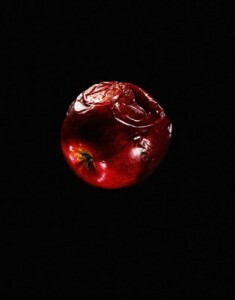 He recently was drawn to photographing fruits and vegetables in various states of decay. Ian Trask graduated from Bowdoin College with a major in Biology and then worked as a technician in genetic research labs. In late 2007, he moved to New York City to be an artist. 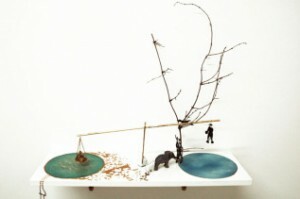 He is a sculptor who explores the inherent aesthetics of material waste. Alison Wilder grew up in Vermont and Iowa, and graduated from Bard College last May and then moved to Sunset Park, Brooklyn. She’s been busy conceiving a life rooted in sculpture, textile processes, queer politics, and homesteading activities. She makes large-scale, site-specific, mutating sculptures. 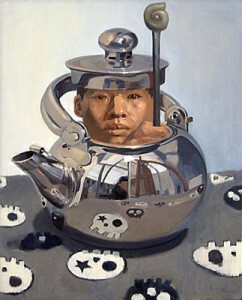 Shawn Yu was born in China and raised in the United States. He has been drawing since he was young and went on to work in art as a way to enjoy life and express that enjoyment of life. He says that his art offers windows into strange worlds, which he believes trigger feelings akin to being a child exploring the unknown. Recession Art screened an eclectic mix of short films from emerging filmmakers, including provocative shorts and dark comedy to documentary and experimental sound pieces, all curated by Jesse Wakeman. Live Art Night featured Matthew Silberman‘s jazz saxophone stylings, Theatre Reverb‘s off-the-wall performance pieces, Leslie Goshko‘s hilarious comedic monologues, This is Just a work-in-progress dance piece by Stephanie Fungsang and Jeremy Finch, and country/soul/antifolk musician Isaac Gillespie.